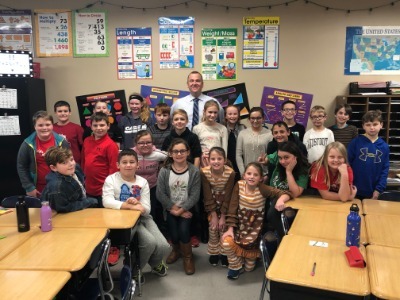 Murray, KY – After five weeks of studying with Tim Stark from The Murray Bank, Fifth grade students in Mrs. Kellye Steele’s class at Southwest Elementary School received graduation certificates and celebrated with ice cream in the classroom upon completion of the Junior Achievement “Our Nation” program. This particular program introduces fifth-grade students to the intersection of work readiness and upper elementary grades social studies learning objectives. Through hands-on classroom activities, the “Our Nation” program provides students with practical information about the nation's free market system and how it serves as an economic engine for businesses and careers. The curriculum also introduces the need for entrepreneurial and innovative thinking to meet the requirements of high-growth, high-demand careers and the concept of globalization in business. Junior Achievement is the world's largest organization dedicated to giving young people the knowledge and skills they need to own their economic success, plan for their future, and make smart academic and economic choices. JA programs are delivered by corporate and community volunteers and provides relevant, hands-on experiences that give students from kindergarten through high school knowledge and skills in financial literacy, work readiness and entrepreneurship. Today, JA reaches four million students per year in more than 120 markets across the United States, with an additional six million students served by operations in 119 other countries worldwide. Visit www.ja.org for more information.